The goal of this project is the study of a novel design approach to hardware implementation for testing and using the capability of self-assembling, self-organising, and metamorphosis of robotic systems called SWARM-BOTS. Such an approach finds its theoretical roots on recent studies in swarm intelligence, i.e., in studies of self-organising and self-assembling capabilities shown by social animals (see figure 1). An important part of the project consists in the physical construction of at least one swarm-bot, that is, a self-assembling and self-organising robot colony made of a number (30-35) of smaller devices, called s-bots. Each s-bot is a fully autonomous mobile robot capable of performing basic tasks such as autonomous navigation, perception of its surrounding environment, and grasping of objects. A s-bot is also thought to be able to communicate with other peer units and physically join either rigidly or flexibly to them, thus forming a swarm-bot. A swarm-bot is supposed to be capable of performing exploration, navigation and transportation of heavy objects on very rough terrains, especially when a single s-bot has major problems at achieving the task alone. The hardware structure is combined with a distributed adaptive control architecture inspired upon ant colony behaviors. An s-bot is shown in figures 2 and 3. As can be seen there, the mobility is ensured by a track system. Each track is controlled by a motor so that a robot can freely move in the environment and rotate on the spot. These tracks allow each s-bot to move even on moderately rough terrain, with more complex situations being addressed by swarm-bot configurations. The motor base with the tracks can rotate with respect to the main body by means of a motorized axis. 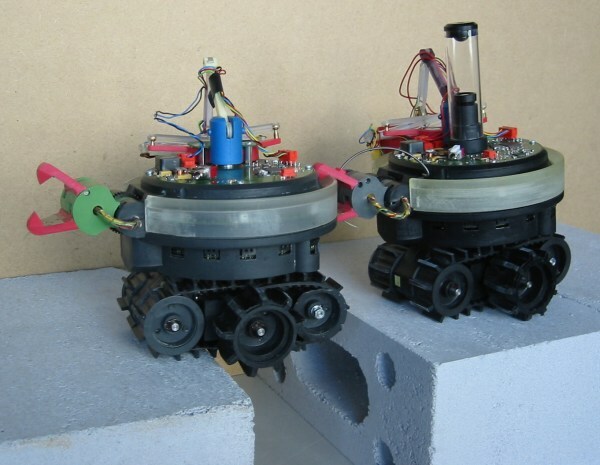 S-bots can connect to each other with two types of possible physical interconnections: rigid and semi-flexible. Rigid connections between two s-bots are implemented by a gripper mounted on a horizontal active axis. This gripper has a very large acceptance area that can securely grasp at any angle and lift (if necessary) another s-bot. Semi-flexible connections are implemented by flexible arms actuated by three motors positioned at the point of attachement on the main body. The three degrees of freedom allow to move the arm letrally and vertically as well as extend and retract it. 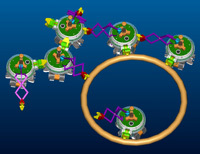 Using rigid and flexible connections, s-bots can form a swarm-bots having 1D or 2D structures that can bend and take 3D shapes. Rigid and flexible connections have complementary roles in the functioning of the swarm-bot. The rigid connection is mainly used to form rigid chains that have to pass large gaps, as illustrated in Figure 5. The flexible connection is adapted for configurations where each robot can still have its own mobility inside the structure. The swarm-bot can of course also have mixed configurations, including both rigid and flexible connections, as illustrated in figure 4. Potential application of this type of swarm robotics are, for instance, semi-automatic space exploration, search for rescue or underwater exploration. For more information please look at the official swarm-bots project site. Figure 1: Ants can form structures to pass important gaps. Figure 2: Picture of the first s-bot prototype. The diameter of the main body is 116 mm. 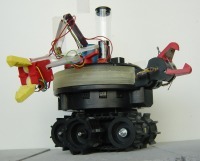 Figure 3: Picture of the second s-bot prototype. The flexible gripper has been redesigned. Figure 4: Most swarm-bot configurations will include both rigid and semi-flexible connections. Figure 5: The rigid connection can be used to form chains and pass big obstacles and large gaps. We now have two functional prototypes. We are working on some behaviours, using a single robot or even with more then one robot. On the software side, the XScale processor board is running Familiar/GNU/Linux with wireless ethernet. We are also syncing the real datas with the simulator so that a simulated behaviour can easily be ported on the real robot. A swarm-bot (consisting in 2 s-bots) joining to go over a gap. MPEG, (2.4 MB). An s-bot following humidity gradient while avoiding obstacles using accelerometer information. MPEG, (4.0 MB). A swarm-bot (consisting in 2 s-bots) joining to climb up a step MPEG, (1.6 MB).